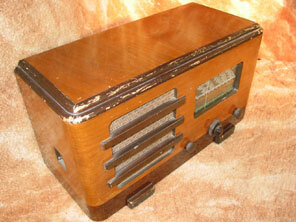 Shown above is the model 72 from about 1939. Cossor have now bowed to the inevitable and the receiver uses a superhet circuit. Obviously Cossor valves are utilised on the chassis, winding up with a 2XP output valve. 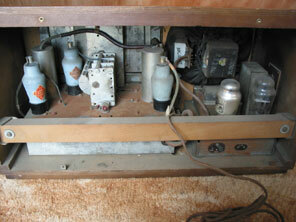 Notice that the output valve, rectifier and power supply components are on a separate chassis (right of cabinet) to the radio chassis. This meant that the radio chassis was not as wide as it would otherwise have been, and so made it easy to use the same chassis components in both horizontal and vertical cabinet styles. When used in the upright cabinet the radio chassis would be at the top of the cabinet, with the power and output chassis in the lower half of the cabinet. This cabinet chassis disposition can bee seen on the model 77 shown on the next page (although they are not exactly the same chassis’s). The on/off control is a toggle switch positioned at the side of the cabinet in a wooden recess. Valve line-up for 72 is 41STH, MVSPENB, DDT, 2XP, 431U.